Rated 5 out of 5 by earlyriser09 from Does not disappoint! I absolutely love the Dark Parables games. I own all of them. When I saw there was a new one, I bought it without even playing the demo and was not disappointed! 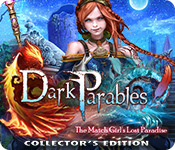 I won't go into every small detail and option of the game since others have already done that, but will just say that if you love the previous Dark Parables games then you should love Dark Parables: The Match Girl's Lost Paradise Collector's Edition. Rated 5 out of 5 by Brendansoma1 from Match girl with a twist The only 'match' this game has with reference to H.C. Andersen, is that it takes place on the Danish island Funen where he was born. As I'm not a fan of any one developer or series, I judge a game in itself. And found this excellent. Some of the puzzles are new, and can be challenging. The FROG's are in themselves good, but I don't care much about this aspect of the game.The map (which I needed quite a few times) is very helpful. I loved the graphics. I don't play with sound, so can't say anything about that. Rated 5 out of 5 by Majestyx12 from Fragmented in more ways than one Based on the finished game with bonus material In Denmark our Detective follows the match girl Giselle. I found pieces for six parables (two in the bonus chapter) and 20 morphing objects. The music is pleasant. I found flaws- The guide said 6 chapters but the game had 9 chapters. I found two puzzles with no instructions and the guide didn't help. But one puzzle is replayed and has instructions there. I had one place that paused itself and I turned it back on. Besides these things, I loved the game. The bonus is a prequel called The King's Fiery Clothes. Has replays on 17 mini-games, 20 lovely fragmented hops, 9 video, 6 music and 8 wallpapers. Rated 5 out of 5 by JocastaSilver from A Tragic Chapter to the Dark Parables Franchise This story is loosely inspired by the Little Match Girl, with a bit of the Emperor's New Clothes, and Narcissus. The game starts off slow, but picks up speed and by the end my heart was ripped to pieces. I also liked the connections to certain past Dark Parables games. The VA was superb, and the bonus chapter provides some backstory for the match girl. Rated 5 out of 5 by Marja67 from Love Blue Tea I have bought all of this series. An automatic buy when I see them. Beautiful graphics and pretty music. It is fantasy so doesn't have to follow the old story. Rated 5 out of 5 by Liadan from Another fantastic DP addition! Yet again, I'm amazed by the art, animation, puzzles, and story for this, the newest chapter of the Dark Parables series. It was great to be taken to the homeland of the creator of The Little Match Girl and see what twists her story would have. The connections to past games were good. There's no teaser for the next game, but at the first glimpse of nutcracker soldiers, I couldn't help but wonder if it might be Nutcracker related... As usual, I'm left craving for the next installment... Can't wait! Rated 5 out of 5 by twodoguemom from Beautiful Just wanted to add my voice to the positive reviews. I love that they've made the map easier to use. 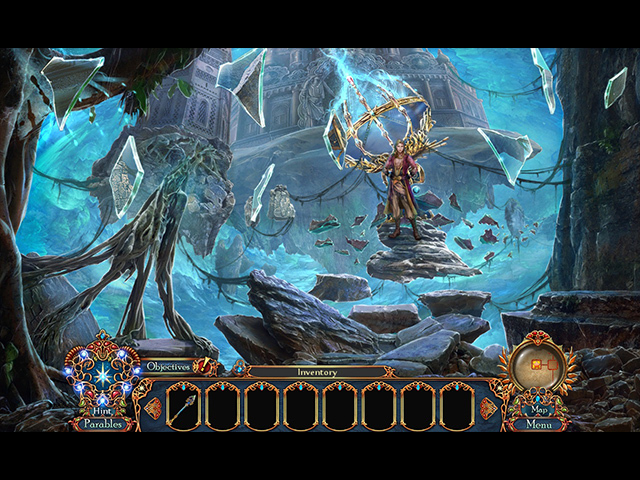 The art is amazing and I actually liked several of the puzzles (which I usually skip). It's a definite buy for me. Rated 5 out of 5 by loondance from The Match Girl Exquisite game in every way! From the plot, to the graphics, to the hidden object scenes...there is nothing that I didn't absolutely love about this game! Well done! Rated 5 out of 5 by LogieBaby from Dark Parables continues to be one of the few series that never disappoint Whenever a new Dark Parables game is made available I am more than pleased. For one, this is a fantasy genre entry that is not a cartoon, does not overwhelm the player with cute little creatures, elves, goblins, etc. and most importantly is geared to adults. As is always the case with DP games, the Match Girl is stunning to look at and the fractured object segments provide challenge to complete not to mention the finished product in all FROG scenes are gorgeous. The story does not keep with the original fairy tale by Hans Christian Andersen in that in the game the Match Girl is not a very nice character but I'll wager this will change as the saga reaches its conclusion since all DP games resolve issues with the " bad guy " and bring them back among the gentler souls. Although it is a minor flaw the opening cut scenes should not have the detective using a modern recording device since it never is in keeping with the otherwise old-fashioned flavor of all Dark Parables. Like I said a minor flaw but Blue Tea should nevertheless address it. I own all entries in the series and always enthusiastically endorse them. Match Girl is no exception as it is another Blue Tea diamond. Rated 5 out of 5 by biscuitsmama from A DARK PARABLES GAME THAT IS EXCELLENT AND CLOSE TO WHAT I LOVED IN THE ORIGINALS Dark Parables The Match Girl’s Lost Paradise is the fifteenth game in the series and is the eighth one developed by EIPIX with the first seven games coming from Blue Tea Games who is the original developer of the series. Although this game was completely developed by EIPIX, it is in my humble opinion one of the closest to the original series aside from The Little Mermaid and The Purple Tide. After a rash of very short games that have only three or four chapters I am finding this game to be quite long with six chapters plus the Bonus Game. I have played for several hours and still have quite a long way to go in the game. As I played the game I was swept away by the touches that reminded me of what I loved in the original series. Although the HOPS might not have had the complete glitzy appeal of the originals they were close enough that I truly enjoyed them. The Puzzles are great and started off with a mechanical maze puzzle where you move the pieces by selecting arrows and moving a central bar. I found more HOPS early in the game than I did puzzles but I found both the HOPS and the Puzzles enjoyable and well done. I think the instructions for solving the Puzzles were a bit better in this game and it was easier to understand what needed to be done. Since I don’t believe in giving away all of the details of the game I will only say that if you loved the original Blue Tea developed Dark Parables, then I think you should enjoy The Match Girl’s Lost Paradise. What EIPIX brings to the table with these games is a functionality that I found missing in the originals. I was never able to get the maps to work correctly even when I was told they would be “jump” type where I could immediately move to another location. I also find the storylines a bit more compelling. If you happen to prefer the CE version of the game this one has morphing objects and collectible parables that are located in various scenes in the game. There are also the other goodies to be found that we all love in CEs such as Wallpapers, Concept Art, Achievements, Music, a Bonus Game, a Strategy Guide and we also get to replay HOPS and Puzzles. In the past year or two I have fairly much lost interest in the Dark Parables series as I missed the beauty of the original games. That being said, I must say that EIPIX has done an excellent job with creating The Match Girl’s Lost Paradise. As always I recommend that you try the demo to see what you think about the game but I hope you will enjoy it as much as I do. Happy gaming! Rated 5 out of 5 by diamond_dust38 from Dark Parables: The Match Girl's Lost Paradise I played the beta version of this game and loved it. I have been waiting for the release will be getting this game too I have all of the Dark Parables games love the story line in all the games and the HOS in this game are good the story line is a good one the coloring and art work are great had no glitching game played great for me. if you like the the Dark Parables game you will like this one as will. Rated 5 out of 5 by sunnyglow from THE ‘FROG’ PRINCE HAS GRANTED YOUR WISH FOR A MAGICAL GAME REVIEW BASED UPON THE ENTIRE GAME 6 Chapters Plus a Bonus Chapter – Strategy Guide: 51 Pages STORY: Detective! - you are off to Funen, an island off the coast of Denmark to investigate a case of arson. Fires are appearing all over the village; however, no trace of a fire is seen afterward. People trapped within the burning building are missing; however, no bodies have been found. It is as if the body is engulfed by the flames. The only clue is that a girl selling matches has been spotted near the crime scenes. Rumor is that she is a witch who grants wishes. However, is that true or just a myth? Find yourself switching between the worlds of illusion and reality in search of the answers to solving this case. Be careful what you wish for! You may get it in this game! OPINION: Our FROG princes have created another opalescent, gem-like masterpiece in their Dark Parable series. This game has a touch of magic brought to life by the magic wand wielded by the genius of this developer. This is an old school style gem which displays master craftsmanship. You don't find many games like this any longer! The game is of decent length and has a good pace with plenty of activities and action to keep the player engaged. The graphics are incredibly beautiful with gem-encrusted inventory items which look like fine jewelry. The parable behind this game is excellent. There are hand-drawn scenes packed with fairy tale characters. There is a moral behind this gaming parable which makes it a great game for the whole family. MECHANICS: There are four (4) levels of play including a customized version. There are thirteen (13) achievements. Collect twenty (20) morphing objects and twenty-eight (28) picture pieces to open five (5) parables in the main game and two (2) in the bonus chapter. I found some of the morphing objects somewhat difficult to locate. There are eight (8) wallpapers along with casual art and music and video selections. You can replay seventeen (17) puzzles and twenty (20) HOP scenes. In the main chapter the parables are: “The Little Match Girl,” “The Star Coins,” “The Ominous Beauty,” “The Forest Witch,” and The Second Prince’s Revenge.” In the bonus chapter they are “Fire of Youth” and “The King’s New Clothes.” BONUS CHAPTER: It is a prequel. The misguided Match Girl is off to visit King Oberon to try to save the kingdom. She is out to make her missing grandmother proud of her. The old king wants to be restored to his youth, but at what price? It has four (4) FROG scenes and four (4) puzzles. The bonus chapter is not very long, but I feel the story is excellent and provides more detail on the background for the main chapter. HOP SCENES: They are all FROGS – producing incredibly beautiful jewel-encrusted inventory items. Most of them are emblems of some type. There are twenty (20) FROG scenes in the game. PUZZLES: There are twenty-one (21) puzzles within the game. The puzzles are creatively designed. 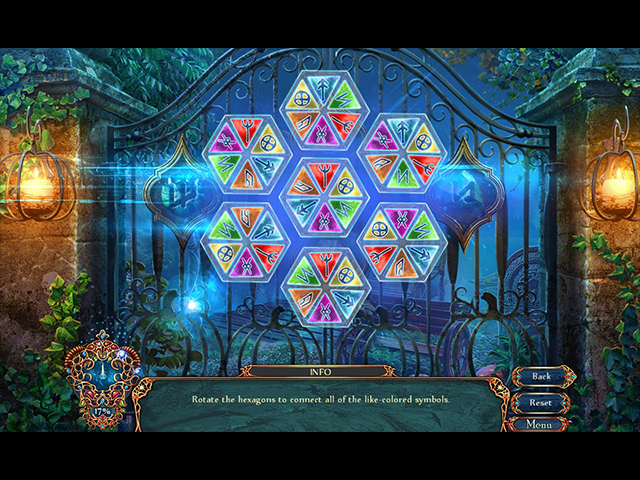 They vary in difficulty and there are some puzzles within this game which provide three (3) variations of the puzzle, each increasing in difficulty. There are some multiple-step ones as well. SPOILERS: HERE ARE SOME SAMPLES OF THE PUZZLES AFTER THE DEMO: A. Multiple step: (1) Rotate zodiac symbols with markings along the outside of each symbol so that the markings match up with those on the symbol next to it. (2) On an astrolabe, rotate the signs which match those in the first part of the puzzle, so they are both oriented in the same direction. 3X B. Sliding tiles puzzle. Slide tiles into place so that each row has tokens matching the one along the side of the grid. C. Sequence puzzle. On a grid, turn off lights so all are off. Clicking on one light affects the others which surround it, either turning it off or if it is off, turning it on. 3X Increases in difficulty D. Matching puzzle. Match up symbols on a bow with those on a monster E. Connection puzzle. Rotate seven (7) tokens, each with four designs on them, so that matching ends are the same. F. Maze puzzle. Move a token from beginning to end by logically stepping on the correct tiles. If you step on the incorrect tile, you are sent back to the beginning. G. Physical puzzle. Keep the pointer on a symbol as it moves around the screen. 3X BONUS CHAPTER: H. Toggle pieces of a picture until they fit together to reconstruct a picture. I. Connection puzzle. Switch foods so that a twisted path leads from the food item to what it is made from. J. Connection puzzle. Connect all dots on a mirror without retracing steps. K. Pipe puzzle. Interconnect all pipe segments so they connect to each other. Rated 4 out of 5 by thetincanman from twists and turns absolutely another success. Great graphic's through out loved the music. Will recommend this to all. Well done team. enjoyed immensely. Rated 4 out of 5 by juliaeatapple from Dark Parables are back! That is what a dark parables game should be! It has all the elements a good game should have. Nice music, charming characters, well-designed puzzles, and a good plot. I really enjoy the story. At the same time, it has some shrotcomings. First, the movies are a bit blur and jagged. I think EIPIX and Blue Tea Games should make them better. Second, the puzzles and HOPs are too easy to me. The items in a HOP are easy to click because the color isn't toned well. It doesn't take me too much time to slove them. In short, Dark Parables: The Match Girl's lost paradise is a good game for those who want to enjoy good plot and beautify artwork, but it isn't a challenging puzzle/HOP game. Rated 4 out of 5 by codom from Eipix / Blue Tea Finally Found Their Combined Groove I was actually surprised at how much I enjoyed this game. While puzzle complexity is a personal thing, this game got it right for me...not brain-busting and not kindergarten easy either.. Overall the graphics were pretty good all though the animation could definitely use some improvement. (For the life of me, I don't understand why EIPIX does improve this and the graphics compression). They once told me they create games in HD and then compress them for BFG. Here's an idea - create them at a level that doesn't require compression! Rated 4 out of 5 by veloster12 from disapointed great game till i got to a certain area and then couldn't pick up an item i needed so game came to a quick end. un-installed, re-installed still can't get it work. really disapointed. Rated 3 out of 5 by cottoncandy2 from So Frustrating There's one puzzle where you have to look through a telescope and focus on half a dozen symbols but it just takes forever. It's very tedious. You have three buttons to choose and you're just clicking, clicking, clicking until it either focuses or not. I switched difficulty levels so I could just skip it but the skip feature isn't working so I'm basically stuck here now. Too bad. I was really enjoying the game up until now. It says you can switch difficulty levels but maybe not. Rated 3 out of 5 by GRHA from Not up to the usual Parables standard What a mixed up game. Story line very confused. Games were generally OK but not as difficult to find objects as others in the series. Glad I brought this on offer and not pay full price. Rated 3 out of 5 by Linochka from What happened ? I always loved "Blue tea" game for their graphic. Very intricate almost real feel to it . This game feel like it was created by a child . Storyline all over the place,Very cartoonish feel to it . For the first time I actually sorry that I bought this game . After having all of them.....it is very disappointing . Rated 3 out of 5 by kkristins from Another Poor Quality Game I was so excited when another Dark Parables came out but was so very disappointed to learn that it was such poor quality! The last release was excellent, like the old Dark Parables used to be! This one, unfortunately is like the previous ones, poor quality! I always purchase these games but not this time. Rated 2 out of 5 by Cookie827 from Forced myself to play As soon as I started this game, I could tell it would not be top on my list of games. Boring. 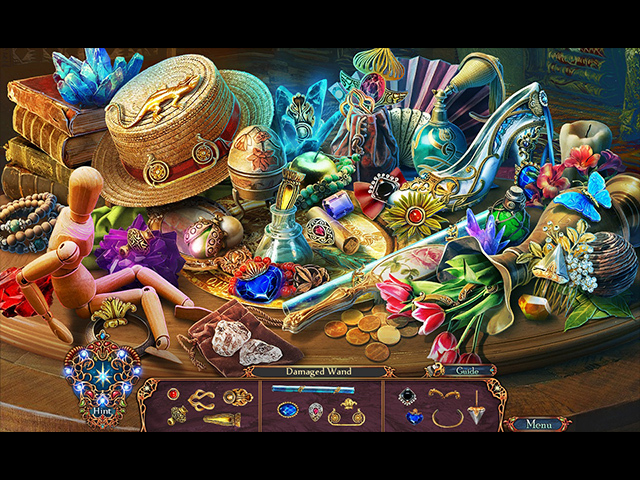 Way too much back and forth and the hidden objects required piecing items together. Been there, done that too many times. Too repetitive. Graphics were not much and way too much dialogue. I wish there were more puzzles and less hidden objects. I play many hidden object games, but this is one I will delete. Only finished playing because I paid for it so I was going to play it. Rated 2 out of 5 by Maniactree from Disappointing I loved the real story of the Little Match Girl. When I first read the story as a child, I cried because I felt so sorry for her. So why did they have to cast her as a villain in this? That really bugged me. While the graphics were better than they have been in the last number of games since Eipix joined up, it wasn't enough for me to enjoy the game. I felt like I was constantly moving from place to place. There was exactly one thing to do in a location, and then you had to move. I found myself just getting annoyed. In fact, I have not played the bonus chapter yet, and don't know if I will even bother, for that reason. I used to love these games when it was just Blue Tea Games. Since Eipix came on board, I have been completely underwhelmed. The only reason I bought this one was because it was The Little Match Girl. I should have known better. I think this may be my last Dark Parables venture. It's such a shame, because I love the FROGS.